It’s National Nutrition Month, and to celebrate we want you to “Shape Up Your Plate.” (Kind of sounds like an order you might hear barked in an Army mess hall, right? “Shape Up Your Plate,” recruit!) Well, that is this year’s theme, and you are the recruit. We want you to get healthy by eating healthy. And this week we’re going to do that by putting the spotlight on flavor — specifically the flavor of salt, and next week we’ll look into the flavor of sweet. Remember as a kid hearing the phrase “You are what you eat” and then thinking, ‘Wow, I don’t ever want to turn into a squash’? Well, if you are someone who knows that eating more vegetables is really good for you, but most of the time you just can’t bring yourself to do it, now is the time to overcome your apprehensions. If you are a person who considers yourself a connoisseur of healthy foods, hopefully this series reaffirms your love of food and gives you some fresh ideas! You may not have thought about it, but there are really four distinct flavors that we normally distinguish in the western world: sweet, salty, sour, and bitter. When it comes to eating vegetables, the complaint dietitians hear most often is, “I don’t care for the taste.” The funny thing about food is everyone has a different opinion of what tastes good. But if taste is the issue, let’s consider our options. We’ve already identified the four tastes. What if we picked the taste we enjoy most and then looked for ways to prepare foods that met our flavor criteria? Maybe then we could combine enjoyment of vegetables with the intake of valuable nutrients like fiber, vitamins and minerals. Is it possible people dislike certain food groups because they’ve yet to find a way to make them taste like items they enjoy? The taste of salt has often been credited with an ability to draw out or emphasize different flavors in a dish. It turns out that salt makes it easier for scent molecules to separate themselves from food, so salt increases flavor by intensifying the smell of the food. New research actually suggests our brains consist of multiple areas that interpret taste, as opposed to the previous thinking that we had a single “taste center.” Taste actually comes from a combination of receptors in the mouth, scent from the nose, and — surprisingly — from the language center, which helps us verbalize what we feel in our mouth. Salt plays a number of roles in food, digestion and taste, so it’s easy to see why this hard-working flavor is desirable. Roast vegetables in the oven to draw out a deeper, richer flavor. Often seemingly bitter tasting foods that are roasted with minimal salt can emerge sweeter and more palatable. Use herbs and spices to liven your foods in place of or in combination with small amounts of salt. Because salt can draw flavors out of a dish sometimes just a touch in combination with other bold flavors can produce a delectable product. Try a finishing salt to round out the flavor at the end of the cooking process. Finishing salts — examples include pricey varieties like the French sel gris (“gray salt”) or various sea salts — still have the same amount of sodium as regular salt, but because they’re added at the end of the cooking process their flavor, although milder than table salt, seems more pronounced — meaning you naturally need less. The extra cost associated with these delicacies of salt may also help keep your desire for a heavy hand in check. Try the following recipe, adapted from Experience Life Magazine, for a deliciously different way to enjoy cauliflower. Preheat the oven to 400 degrees. Toss chopped cauliflower with 1 tablespoon of olive oil and place on a baking sheet. Roast 30-35 minutes, turning cauliflower once or twice, until the cauliflower is soft to the touch of a fork and golden in color. 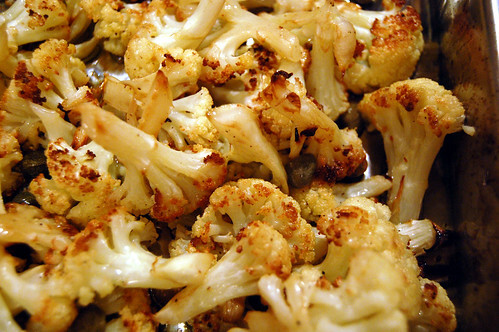 Once cauliflower is roasted, heat a small pan with 1 tablespoon of olive oil and add the garlic. Cook for 15 seconds, stirring often. Add the capers, lemon zest, lemon juice and black pepper. Stir until mixed, pour over cauliflower and serve. Good luck with this week’s assignment and don’t forget to check back next week when we dig into the flavor of sweet! How do you like to cook healthy with salty ingredients? I hope you enjoy the recipe! Thank you for the comment; check back next week for a sweet vegetable recipe. Hi Pepper, thanks for the comment. I hope you enjoy the recipe. Check back next week for a great “sweet” vegetable recipe! Check the “Get Official Samples” to find out where you can get the newest free samples. Every day you’ll find out how to get the best free samples sent straight to your mailbox. I was steaming my Cauliflower, which was not very exciting. This recipe sounds better and I will give it a try. I recommend sprinkling toasted pine nuts on it too, they seem to go well with Cauliflower and olive oil. Recipe aside, this is a great article btw.